Each week I have a giveaway here and this week I'm excited to say that I am hosting a giveaway for Christine Marie Ford (http://www.christinemarieford.etsy.com/) A fabulous artist who specializes in Jewelry, Fiber Art, Quilting and Inspiration! This gorgeous Mini Suede Journal/Sketchbook is created with beautiful high quality medium brown suede leather which Christine hand picked right from the tannery. 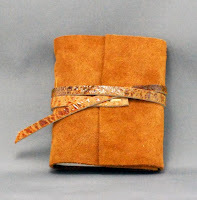 It als features 160 pages total(both sides); size is approximately 3" x 3.75" (50lb, acid free, 100% recycled) and is hand bound with beige waxed Irish linen thread. The strap is made from a more unusual leather to add visual interest and to hold the book closed when not in use. There can be only one lucky winner! Best of luck to all who enter!! So...if you do ALL 7 of the above you will have a total of 20 entries to win Christine's Mini Suede Journal/Sketchbook. Thanks for blogging in on this Marvelous Monday. By the way, when do you announce the winner?